Yeah, but: Sometimes a case is just a case. The Long Version: Some things improve with use and time. Products that are designed to accept the patina of age gracefully can develop a wonderful character from scuffs and wear, and never really need to be replaced. Natural materials like wood, leather, and canvas are the best for this, but Leica has proven that even metal machines can acquire a certain charm after decades of use. Absolutely none of this applies to cell phones. While hardly timeless, the current version of Apple's iPhone is a beautiful example of industrial design. The layered edges where the metal meets the glass are meant to be touched and handled; the latest "4S" revision has removed the antenna problem that left the previous model wrapped in ugly plastic. But the phone certainly isn't something that will have its appearance improved by scratches, and those smooth surfaces that invite touching are also very slippery to hold. The Sena Ultraslim case solves many of the iPhone's problems. On paper it's just a simple sleeve that's very closely tailored to the iPhone 4/S, and protects it from scratches and minor bumps. 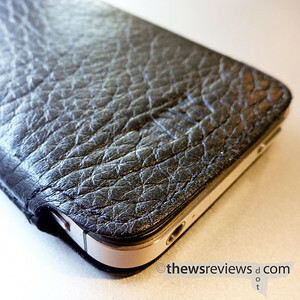 But in practice the supple textured leather is a sublime physical compliment to the iPhone. At the risk of running into dangerously yoni-and-lingam territory, the phone and case have all kinds of perfect opposite characteristics: soft/hard, warm/cold, textured/smooth, yielding/firm… and like the iPhone, it's hard to resist touching it even when it's not strictly necessary. When it's brand new the Ultraslim pouch needs a certain technique to unwrap it from the phone, but it's easy enough to master. After just a few days the leather stretches out, and after two weeks of use mine is a perfect fit. It's showing a little smoothness on the bottom and sides, and a slight crease across the top from taking the phone in and out, but that really does just add to the leather's character. 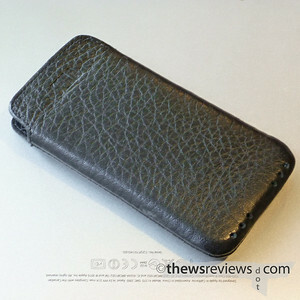 I used RIM's leather case for my Blackberry, and like the device it housed, it was a rigid and substantial – but functional – accessory. So I already knew that I would like the Sena sleeve when I bought it, but I'm still surprised by just how much. No, it doesn't provide much protection from catastrophic damage, but if I really felt the need for an Otterbox then I would have just bought a Sonim instead. The Sena Ultraslim is easy to carry, protects against unsightly blemishes, and is one of very few cases that actually makes the iPhone 4S even better. Add in the luxurious feel of the leather, and that's a hard combination to beat.